Shortly before the holidays, my friend & pastor Erika G. tagged me in a Facebook ad she saw from a local kitchen supply store, with the mentioning that I simply ‘had to’ respond. “This is so you!”, she said, “You should apply!”. I don’t know how or where she saw the ad, but I never did and Lord knows I spend enough time on Facebook food pages that I should have seen this. Anyway, considering the fabulous Erika G. is my pastor, I think she was summoned by divine intervention and then asked to channel one of the three wise men and deliver this gift to me… by means of modern communication, rather than camel. The ad in question came from Surfas-Culinary District, and it was an open invitation to all local food bloggers to apply to become a ‘product reviewer’. Sounds fancy, huh? I nearly wet myself from excitement. Not only have I been a customer of theirs for several years, but more importantly, I love that store. As in ‘luuuuvvvvv’. I totally understand that this sounds fishy now that I’m an official Surfas endorser, so to speak, but if you’ve followed this blog, then you’ve seen me write about Surfas long before I even applied to their ad. And my friends know that if they dare ask me where to find something, I send them to Surfas. Plain & simple. The walk-in store in Culver City, CA is the perfect combination of industrial urban-ness and artisanal food shopping, and while the building and/or atmosphere inside may not be as visually elegant as ‘Sur La Table’ or ‘Williams-Sonoma’, there is nothing you can want that Surfas doesn’t deliver… It’s foodie heaven, I tell you. My mother knows this too, and a trip to Surfas is on the agenda every time she visits from Belgium. It’s also my ‘go-to’ place when she tells me that she *must* find natural squid ink to make black risotto or a ‘thingy that looks like a pincette but is much larger’, which some random celebrity chef uses in Cecilia’s favorite cooking show on Belgian TV… You can bet on it that Surfas has that too. But we digress… Last Saturday, my package with the first few items arrived. I’ve long wanted to try Piquillo peppers, and yesterday was my lucky day. Piquillo peppers are in the chili family, and are traditionally grown in the Northern part of Spain, where they are harvested at peak ripeness and then roasted whole and preserved in brine. The peppers are small, with firm sweet flesh and no heat. They are named after a bird’s ‘piquillo’ (get your mind out of the gutter) or beak, since the peppers have a pointy shape. The fruit very much resembles regular roasted red peppers, but they are sweeter and with a distinct flavor I can’t quite place my finger on. I guess you could say they have a more intense pepper flavor and their texture is firmer yet silkier than that of a regular roasted pepper. Most recipes for Piquillo peppers call for the peppers to be stuffed with anything from cheese to ground beef & fish. However, I wanted to make a meal out of it yet stay true to the flavors of Spain at the same time. The result was pretty darn tasty, and I served it alongside a grainy artisanal bread to emulate that Mediterranean flair. Drain chickpeas and rinse until no longer foamy. Drain Piquillo peppers in a separate sieve and slice each pepper into thin ribbons. 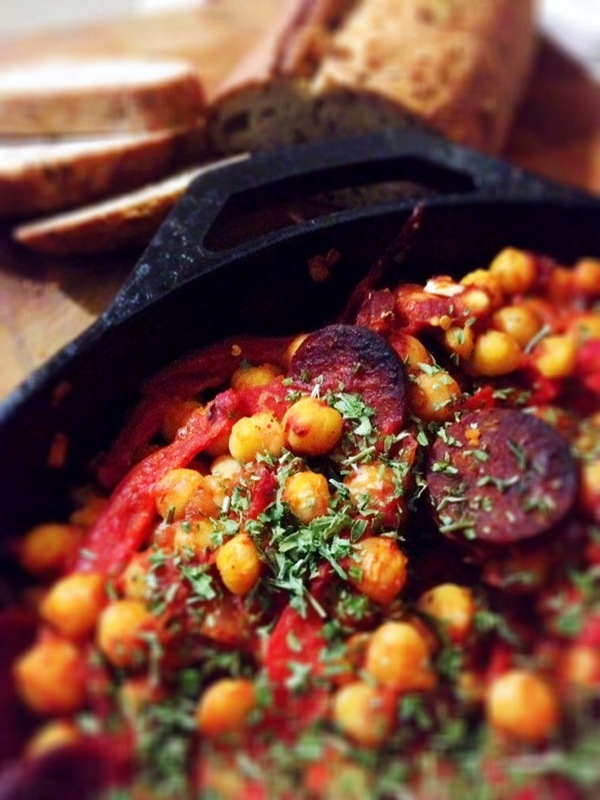 In a cast iron skillet or heavy pan, brown the chorizo until it starts to sweat and turn color a little bit. You don’t want it to be crispy at this point. Add chopped shallots and sauté until shallots turn translucent. Add tomato paste and minced garlic, and cook for additional 1-2 minutes. If your pan is getting a bit crusty, add a splash of cooking sherry and scrape up any bits. Add chickpeas, pepper ribbons, crushed tomatoes, Piment d’Espelette and oregano, and fold everything to combine well. Pour a few splashes of cooking sherry over the heap of yummy goodness and bake for approx. 15 min at 350F until the top is slightly crispy and the chickpeas are heated through. Sprinkle some chopped parsley over the top for prettiness, and serve alongside grainy bread or rice. any ideas for NON PASTA porcinis ? As a side, not a main dish??? So I see you figured out what to do with your Piquillo peppers. Love those things! And this looks delish! never mind, ended up making a bruschetta! It was delicious! This looks delicious. I love cooking with cast iron, nothing else can compare. Yum! This looks so good. Thanks for sharing this at my link party! I hope to see you next week! Oh, Helga! Your recipes always look so awesome, but this one is pure torture! I’m sitting here watching my son’s lacrosse practice, totally starving. And now I think I mighta just drooled a little on my keyboard! I can’t tell you how much I wish I had a big steamy plate of this right now! 😀 Oh – and while we’re talking wishes … I am totally wishing for a Surfas! Why do you West Coasters have all the fun!?!?! Shelley! My god, this was tasty stuff, I say. And really quite healthy too, except for maybe the chorizo. A for wishes, I’ve been wishing for a little bit of “Winter” with snow and all since last 1999….oh wait… was that insensitive?! 😉 You can order from Surfas online. They have EVERYTHING! Thanks for stopping by, as always. Oh – hey! Thanks for the tip on ordering online! And no worries on being insensitive about winter – you know, I kinda chose to live in sub-arctic Ohio 😀 so I really can’t complain, right!?!? If only I could shovel up some of this snow and ship it to you …. You’re welcome, April! I’m glad you stopped by. Thank you for hosting your blog hop parties!